The Real Jenn C.: I Can Go Too? Chad has been traveling the past two weeks. I miss him when he's gone. 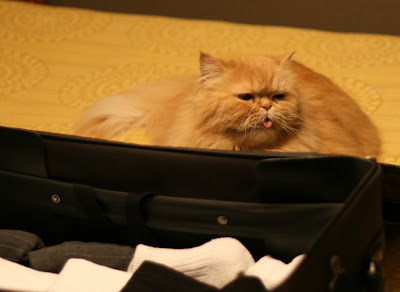 Marigold tries to stowaway in his suitcase. I don't think she would enjoy riding in the luggage compartment. Fortunately, Chad will stay in Austin for the next few weeks.